Shutdown Screensaver allows you to shut down, hibernate, standby, restart, log off or lock workstation after certain period of user inactivity. It will display number of seconds left to shut down, allowing users to terminate the countdown at any time by simply deactivating the screensaver. It allows for 60 days of free "try before you buy" use. Essential for deploying on large number of computers. don't forget to check our volume discounts offer. 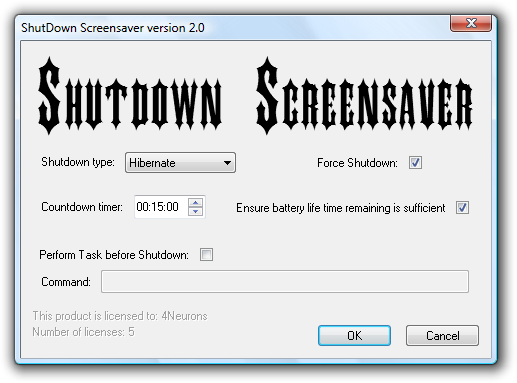 If you are searching for the old, freeware version of Shutdown Screensaver then you can still download it from here: Shutdown Screensavaver 1.0.